OK, what's going on then? This is one of those "Motorways that never were".. So where would it have been? It would have met what is now the M60 at junction 25. Well, that's a long story. 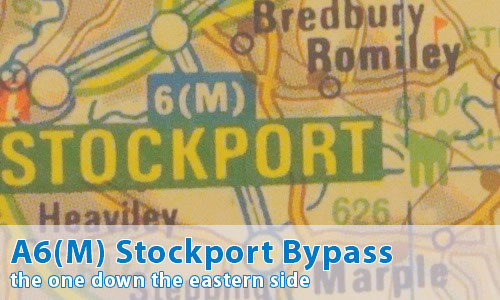 It first appears in 1945, within the Manchester & District Plan as part of the Manchester Outer Ring Road, then again in the 1962 SELNEC Highways Plan. It stays on the back burner all the way through the 1960s and 1970s, though in the late 1970s, the decision was taken that this should no longer be part of the Outer Ring Road, but a stand-alone part of the motorway network, relieving the A6, which runs pretty much right through the centres of Stockport and Hazel Grove. Is it ever going to be built? You mentioned M60 junction 25. That's a really odd junction, isn't it? Yes, the M60 carriageways split and go round a tight corner. That's because the northern part of M60 was formerly M66, which would have carried straight through the junction and onto the A6(M). There's a small gallery of the little bit of tarmac that does exist! Have you got a map that I could look at that includes the A6(M) on it? Yes, I have some scans from an early 1990s Manchester A-Z. Yes - they can be seen on the comments page.